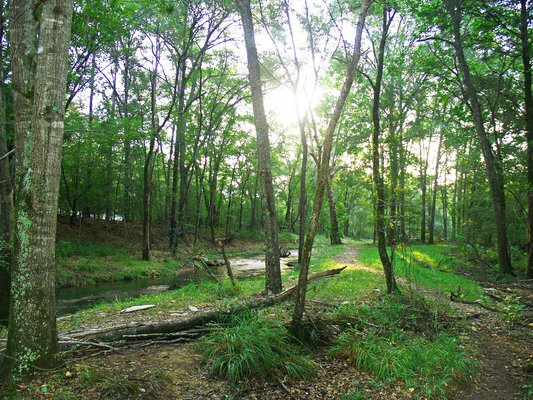 A hiking trail runs alongside Lost Creek in Beavers Bend State Park. The state’s most challenging hiking trails are demanding for different reasons: trail length, rugged terrain or steep incline. Regardless of what makes a trail difficult, a true hiking enthusiast finds something to savor in each one of them. If you’re looking for a hike that requires more than a casual commitment on your part, try these three expert-level paths. The Charon’s Garden Wilderness Trail is located within the Wichita Mountain National Wildlife Refuge near Lawton. When I think of Oklahoma, I think of the open prairie landscape, which is best viewed from atop one of the Charon’s Garden rock formations or nearby Mount Scott. These views are outstanding and are certainly worth the drive, regardless of where you’re traveling from. “Within Charon’s Garden, it is easy to find solitude in a glorious landscape and to reconnect with both nature and yourself,” says Chip Kimball, wildlife biologist at the Wichita Mountains Wildlife Refuge. At 2.4 miles in length, Charon’s Garden is a relatively short trail that begins at the Sunset picnic area. The initial portion of the trail is fairly flat, cutting through mixed-grass prairie and rocky outcroppings, but then it opens out onto a boulder field. From here on, you will have to climb, hop, scramble and crawl over this irregular terrain. Some spots are best negotiated by crawling under enormous boulders. This makes hiking boots absolutely necessary, as you’ll need the traction, stability and ankle protection that this type of footwear offers. While the Charon’s Garden Wilderness Trail isn’t long, it is considered a very technical trail that demands a certain degree of fitness, strength and stamina. This is a great venue in which to combine hiking with climbing and boulder hopping or scrambling. Camping is allowed with a permit, so don’t forget your tent. Bring along plenty of water and keep an eye out for rattlesnakes. Located in picturesque southeast Oklahoma, near the Talimena Scenic Drive, the Horsethief Springs Trail can’t help being so popular among hikers. It’s just so beautiful. This is rolling, rugged country covered in sweetgum, maple, hickory and pine, and laced with clear mountain streams. Horsethief Springs begins at Cedar Lake and winds through the mountains of Ouachita National Forest along a primitive trail. There are several creek crossings along the way before connecting with the 192-mile Ouachita National Recreation Trail. At this point, the trail turns back down Winding Stair Mountain where it ends at Cedar Lake, completing an 11-mile loop. This is considered a demanding hike due to the trail’s steep grades and lengthy climbs up Winding Stair Mountain. Summers here can be hot, so spring and fall may be the best times to visit. The heat, however, didn’t deter some of the notorious and shady characters who once visited here. During the 1930s, workers with the Civilian Conservation Corps built a stone structure to help contain this spring water and prevent erosion, which you can see today. Camping is allowed at Horsethief Springs, and water is generally available from the area’s springs and streams, but it must be treated before drinking. The David Boren Trail begins at the south end of Beavers Bend State Park, near Acorn Campground, and takes a leisurely path north to Broken Bow Lake where it meets the Beaver Lodge Nature Trail. Along the way it passes the dam, which offers a breathtaking view of the lake and its rocky banks and islands, and then west to the spillway and another scenic overlook. This is a 16-mile path through hilly, forested terrain with some creek crossings. Scenic stretches of water are never far away, and that’s one of the highlights of the trail. There are four major trail heads for the David Boren Trail. In addition to the South Park trailhead mentioned above, you can also find access at Beaver Creek (near the nature center), Deer Crossing and Cedar Bluff. Deer Crossing connects the Lookout Mountain Trail with the Cedar Bluff Nature Trail. When you visit Beavers Bend State Park, you’re going to want to stay a while because there is so much to do. One way to do this is to hike the entire 16 miles of the David Boren Trail and camp along the way. If you’re an angler, pack along a fishing rod, because you will encounter places where you’ll wish you had one. If you plan to fish the Lower Mountain Fork River, you’ll need a trout permit in addition to your fishing license. Short on time? Try hiking the Skyline Trail. Though only five miles in length, there are steep climbs and descents, and several creek crossings, so you can burn some calories, clear your mind and then get on with your day. You can access the Skyline Trail just across from the Dogwood Campground. Before hiking any of the Beavers Bend trails, it is a good idea to stop in at the Forest Heritage Center and pick up a trail guide and inquire about the local conditions. Read Hit the Trail – Beginner-Level Trails. Read Hit the Trail – Intermediate-Level Trails.